I was extremely pleased to join my colleagues, friends and clients recently at CommunicAsia in the new Marina Bay Sands conference centre in Singapore. This major event moved a year ago from the old expo centre near the airport to this brand-new complex near the island of Sentosa. 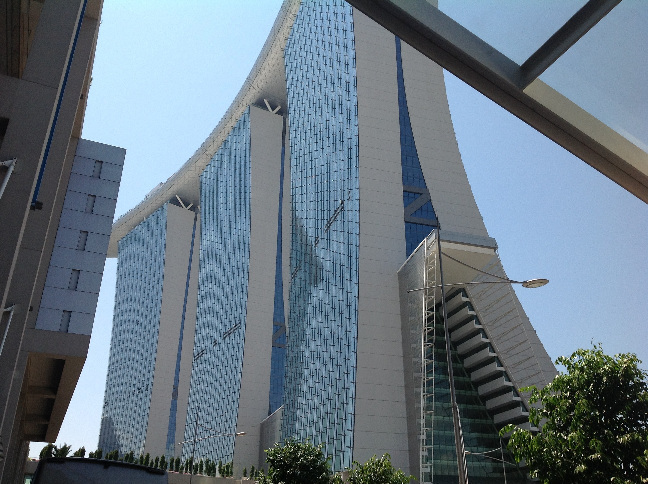 The whole project was designed by the Las Vegas Sands group and is architecturally spectacular. The hotel has 2500 rooms and suites and the whole roof is a sky garden. I felt though that the conference facility was somewhat confused, being spread over several floors. On arrival, this was not evident. Our booth was on the ground floor level, but it took me quite a while before I realised that there were two other whole floors of booths and exhibits. The organisers had also decided to locate the Broadcast part of the show elsewhere, which made it difficult to visit this major part of the expo. 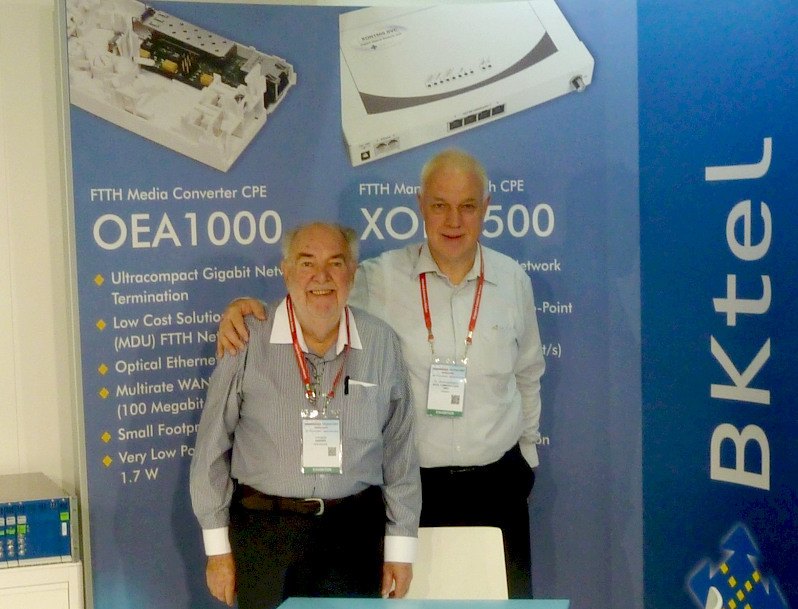 There are several hundred companies exhibiting their products and services at CommunicAsia, all involved in telecoms, broadband, wireless, satellite, components, software. Over the several years I have visited CommunicAsia, I noticed a marked reduction in the number of copper cable manufacturers at the show. However fibre optics products were visibly on the increase. There is no doubt that fibre is gradually replacing copper for communications applications. Some of the manufacturers from China are getting quite aggressive in their marketing. We had several visits to our booth from attractive young ladies wanting to sell us all kinds of Chinese-made fibre-related products, such as ONTs (Optical Network Terminals), however very often their technical knowledge did not match their appearance. Even back in my office I am besieged by emails, Skype and phone calls from China wanting to “cooperate”, ie sell me FTTH components. Inevitably it is bright bubbly young lady vaunting the merits of her company’s products. But they always fall short on technical knowledge: “oh I’ll have to ask our engineers about that”… is often the reply. There is also an evident confusion between the GPON and GEPON standards. GEPON (Gigabit Ethernet Passive Optical Network) emerged first and was adopted mainly by Japan and Korea. The ITU standard GPON (no ethernet) has been adopted more recently in Europe and certainly in my neck of the woods: Australia and New Zealand. Vendors try and push their products when they don’t realise that countries have adopted one or other of those standards, as well of course as Point-to-Point PON in some areas. The technical training of many sales and marketing people is just not good enough. This will improve as FTTH spreads to replace the old copper telephone network. Our booth (www.bktel.com) was part of the German group of companies at the expo. We had access to the German contingent’s host lounge which provided an excellent light lunch each day. All participants from the German group were invited one evening to the German ambassador’s residence. A very generous and pleasant gesture! This shot shows our booth at the show. I’m the “shorty” alongside my good friend Dr Juergen Seidenberg, the CEO of BKtel. More than just selling equipment, the show is an opportunity to update one’s own knowledge, meet with clients from around the world, and renew many friendships in our field. While in Singapore I learned that the FTTH Council Asia/Pacific had voted to hold its 2013 annual conference in Auckland, New Zealand. I will be pleased to assist them in any way with the organisation of this important event. As the New Zealand Ultra-Fast broadband network is being built, many people and their companies will no doubt attend to increase their knowledge of this remarkable new technology.